With walls lined with thousands of English language books, The Bookworm in Yulin has been home base for Chengdu’s book lovers for years. The atmosphere is inviting and gloriously familiar to anyone new in the city or who simply wants to feel like they’re in the developed West for an afternoon. Although I’ve been visiting for years, it wasn’t until recently that I met Peter Goff, the Irish owner who’s been in China for a decade. As the Bookworm’s annual Literary Festival is about to kick off on the 8th of March, I thought this would be a great time to learn more about the upcoming festival and about the roots behind one of Chengdu’s most beloved venues. Over the course of the 3-week festival The Bookworm is hosting dozens of writers from around the world, including Chengdu-based baijiu aficionado Derek Sandhaus who we interviewed earlier this year: Chengdu Stories: 300 Shots of Baijiu. CL: Who are you and how did The Bookworm begin? Peter: I’m Irish and I came to China 10 years ago as a journalist, and soon after a friend, Alex Pearson from the U.K. and I opened The Bookworm in Beijing as a fun project, a home from home. CL: How long have you been in Chengdu, and what brought you here? Peter: I moved to Chengdu in 2006 to open the Bookworm here. I had worked here previously on reporting trips and loved the feel of the place. I was drawn to the energy of the town, and its almost paradoxical nature that on one hand was superbly laid-back and relaxed, and on the other hand was undertaking dizzy levels of development building the fastest growing city on the planet. CL: How many books are at the Bookworm? How did the Bookworm accrue so many English language books in China? Peter: There’s about 17,000 books here now. We have just over 60,000 in total between Beijing, Chengdu and the third location in Suzhou. We bought them in Ireland, the UK, Canada and the US mostly. We picked them up mostly from second-hand bookshops and libraries that were offloading titles when they had multiple copies etc. And then over a period of a few years we put them literally on slow boats to China. CL: What is the Bookworm Literary Festival? When does it start, and who’s involved? Peter: The Bookworm Literary Festival is what we call a celebration of literature and ideas, featuring writers, thinkers, artists and performers from China and beyond. This year we have 80 authors from 18 countries. We also have a Literary Caravan project sponsored by the New York Times where we organise events with international and Chinese authors for Chinese audiences in Tianjin, Shanghai, Ningbo and Chongqing, as well as the cities we have venues in, Beijing, Chengdu and Suzhou. In Chengdu this year it runs from March 8-March 24. It features book talks, panel discussions and performances with authors from Asia, Africa, Australia, Europe and the USA, representing China experts, food writers, new and established literary stars, children’s authors, performance poets and much more besides. It’s an intimate event here. Every year the authors who visit Chengdu comment on the warm welcome and keen engagement with their work that they experience from the Chengdu audience and festival volunteers. CL: What’s your favorite book of all time? 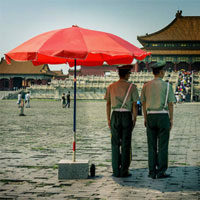 Favorite book related to China? Peter: That changes regularly, depending on my mood, but for now it would likely be One Hundred Years of Solitude, Gabriel Garcia Marquez, or A Hithchiker’s Guide to the Galaxy, by Douglas Adams. Favorite book related to China would be Midnight in Peking, by Paul French. A brilliant and evocative mix of history, reportage and real-life crime thriller. CL: The atmosphere in the Bookworm is famously comfortable for Chengdu’s expats: what’s your secret? Peter: Just simply to set up a place that we would like to go ourselves, somewhere casual that feels like your own sitting room, that’s comfortable, friendly, has books everywhere, good music, decent food and drinks, and interesting discussions. That was the objective, of course with venue management it’s always a work in progress, but that’s what we aim for and hopefully mostly deliver. CL: How do you feel about Kindles and ebooks? Will they ever match the authentic, bound-book reading experience for you? Peter: It’s a love-hate thing. Of course for most of us a digitial browse will never match the sensual between-the-covers experience a printed and bound beauty delivers. Having said that you have to love the convenience of ebooks. And the advent of downloadable books means many people have the tendency to read more than they did before. That’s good to see. It’s driving many bookstores to the wall of course, and that trend can only continue, and I think our communities will miss those spaces, along with the music stores that are also going the way of the dodo. Having said that I am hopeful that there is still a small space for creative and flexible independents who bring a niche to the table. CL: What’s the best selling book that you’ve sold at the Bookworm? What types of books sell really well? 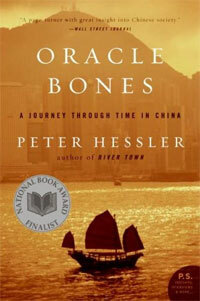 The best-seller over the years has been Peter Hessler’s trilogy, River Town, Oracle Bones and Country Driving. And that genre, China/non-fiction is far and away our core market. People here are keen to read this type of title to help them make sense of the zany world around them. And many people, I suppose, feel their own China experience could make for an interesting read someday, so they want to see what others are writing and compare notes. Personal contact is important in the book-selling world. Many of the China authors have spoken at the Bookworm at some point or another, and people are more inclined to buy a book when they’ve met a writer, heard them present their work, and chatted over a beer or a glass of wine with them. CL: How has Chengdu’s literary scene changed or grown in 5 years? Peter: Weibo and other online elements have really led to an exciting development here in the literary scene. It has stripped away a lot of the exclusivity of the industry. You don’t need to have the trappings, a publisher, agent, or be in the state-sanctioned writer’s association to get your voice heard. You put something out that’s of interest and written well and it’ll get passed around quickly. People will read you and follow you. That’s been a refreshing leveler. CL: What does the future of the Bookworm in Chengdu look like, or Chengdu’s literary scene? 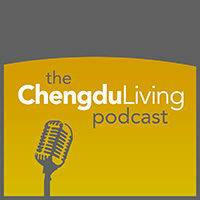 Peter: Chengdu’s literary scene is thriving these days. 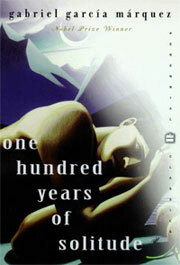 It has got a strong reputation across the nation for producing a plethora of great writers representing all generations and genres. Unfortunately little of this gets translated into English at this point. We at The Bookworm would hope to develop our role here and be a bridge linking these interesting writers and voices to the international community. It can be a fascinating window into the psyche of the community we live in. More information on The Bookworm including map and address: The Bookworm on Chengdu Places. Tickets are available to each event of the Literary Festival for 50 yuan or 400 yuan for access to all events between the 8th and 24th. Thanks! Another thing not mentioned in this post which you brought up weeks ago: the food at Bookworm is better than ever before. I used to seldom eat there but now I definitely think it’s among the best Western restaurants in the city along with The Lazy Pug. Certainly one of the best places in Chengdu to pass a lazy afternoon. My understanding is that a lot of that has to do with the new manager who arrived last year, Andrew. We’ll have to record a podcast with him, I would love to get that side of the story as well. The Bookworm is a great place and Peter Goff is a great guy. Bookworm is not only a restaurant/bar to relax and enjoy food/drinks, but also lots good things happened there. 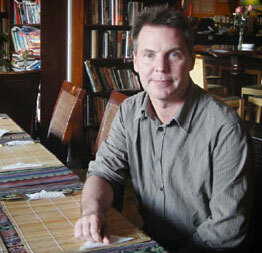 Peter Goff did a lot things for Sichuan earthquake and other charities. That’s something people should remember. It has been a while since I have eaten there – will have to grab a bite sometime. Exciting to see that former CD Living interviewee Derek Sandhaus will be among the speakers at the upcoming literary festival as well. Are you planning on attending the Literary Festival? Great interview. I remember Peter from my time living in Suzhou, where The Bookworm was a regular haunt. I miss it. I’ve never been to any other Bookworm besides the one in Chengdu, but it would be cool to be able to make a comparison. I can say that there is no place in Chengdu like the Bookworm. Whenever I take guests from out of town there they tell me it feels like they’re back in the US. Good questions. And i have to agree that the food is DEFINITELY much better now. I used to seldom go there , but now I am a regular. Me too, I visit several times a week now. 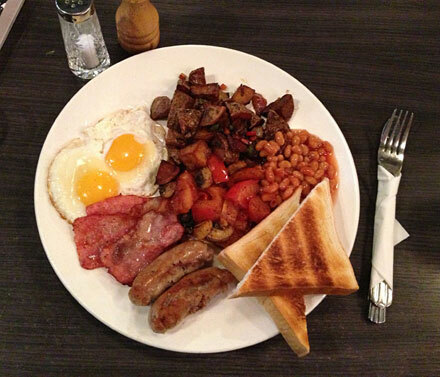 The atmosphere is great, food is great, location is great. Hard to beat that combination. This is a great story, nice read. I had the same idea aprx. at the same time as you. I moved to Guangzhou in Oct. 2001–yes, five weeks after 9/11 incident–and I wanted to start shipping 2nd hand books to China to open a book/coffee shop after settling in. I never followed up on it, although I sent ahead of my arrival some 80 books, mostly paperback I had picked up in garage sales and donations. Everyone of those books are in the hands or shelves of a few pubs and a coffee shop or two in Guangzhou!